Nokia has just unveiled the affordable mid-ranger Lumia 620, but to get Windows Phone to even more people it needs cheaper devices. And that’s where the Nokia Lumia 505 comes in. Those should push it closer to the low end Android devices, but still it’s clear that Android covers much greater depths in the low end than Windows Phone can at the moment. The Lumia 505 is shown in red, and we wouldn’t be surprised to see it in the typically vibrant colors that Nokia devices have. How does such an affordable device look to you? I assume it will be around $4000 (pesos, mxn), which should be around $320 dls. However, Nokia 510 costs $3200 pesos here, so there might be a possiblity for 505 to be even cheaper, which would be rare due to it's 8mpx camera. Wait...i thought 620 was the cheapest. Wow, Nokia is really bringing it on!! Great news!! This is probably WP7.8 vs WP8 of 620. From what i see, the WP integration on the home screen, it's WP8. 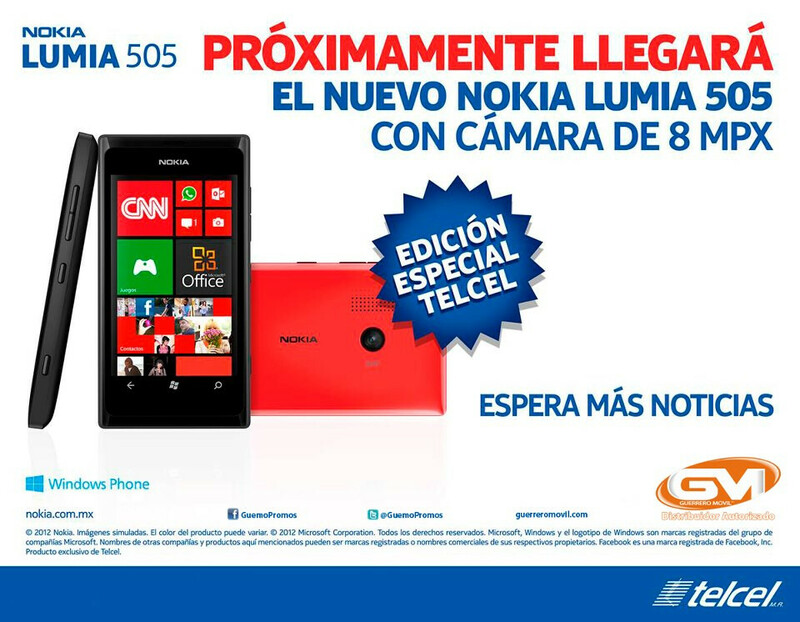 Unless Nokia is just promoting it regardless of the OS used in the 505! wow Folks Nokia is really pushing Windows smart phones to be sold at all levels but how well will they work and folks will they continue to sell the Nokia lumia 800 and 900 smart phones and at a lower cost because they are single core CPU smart phones . I hope that Nokia puts Dual core CPU electronics and a high definition screen into the The Nokia Lumia 800 and 900 bodies to create a second high end smart phone with a high definition screen .the powerful Lumia 920 is the only Nokia smart phone to have a high definition screen to compete with the Iphones and Android smart phones. what a shame too because both the Lumia 800 and 900 are smaller easier to handle smart phones than a big honking more expensive Lumia 920. not everyone wants a super sized smart phone. Wont run Angry Birds with only 256MB of ram, whoops! I live in Mexico and I can tell you that it is not fake. If not, then good for you guys..
After playing with my sons 8X and 810, and my DVP.. I REALLY think from a "regular customer" they wouldnt be able to tell the difference between 7.8 and 8. So using 7.8 (Given by MS to Nokia for pennies) on entry phones, makes the 8 phones that much more of a status phone in those countries.. Makes a lot of sense. it's me or it doesn't have any LED flash? No, it doesn't. Kind of a waste of camera if you ask me. yeah, 8Mpx and no flash. What were they thinking? windows phone what? 7.8? if they want to compete with low end android, they better add memory card slot on that thing! Confirmed: It will run WP 7.8 (most likely WP 7.5 with a future update in Jan-Feb).